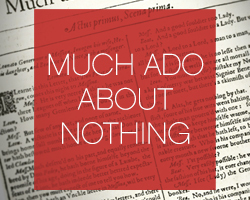 The Old Globe, together with the University of San Diego Graduate Theatre Program, will present Shakespeare’s Much Ado About Nothing, directed by James Newcomb, Nov. 9 – 17, 2013 in the Sheryl and Harvey White Theatre, part of the Globe’s Conrad Prebys Theatre Center. Opening night is Nov. 9 at 8:00 p.m.
Weaving wit, romance and comedy, Much Ado About Nothing is a whirlwind race to the finish line of “happily ever after.” Everyone can see that confirmed bachelor Benedick and headstrong Beatrice are meant for each other – except for Benedick and Beatrice themselves. Love may conquer all, but not without a few battles along the way, and the verbal spars between these two lovers have never been so much fun to watch! A joint venture of The Old Globe and the University of San Diego, the Master of Fine Arts in Dramatic Arts program nationally recruits seven students each year to participate in an intensive two-year, year-round course of graduate study in classical theater. Private funding for the Master of Fine Arts in Dramatic Arts program is contributed through an endowment established by Donald and Darlene Shiley. For additional information, visit www.globemfa.org. Tickets to Much Ado About Nothing are available at www.theoldglobe.org or (619) 23-GLOBE. USD offers students endless opportunities to connect with the campus, the community, and each other. With nearly 200 clubs and organizations, countless sports and residence hall activities, guest lectures, community service opportunities and wellness programs, Toreros have every resource necessary to maximize their USD experience.